I hope everyone had a safe and happy 4th of July Weekend. Me? I'm still painting in the basement but wanted to take some time off to get the news out to y'all and yes, I admit, to take a rest! ;) This newsletter is filled with all the news since the last newsletter to the end of June. The first July edition will be following soon. FAN GET TOGETHER - was a great success!!! We had a really wonderful afternoon - great music and visiting and picture taking. We were wall-to-wall and standing room only, but everyone came together to make this a very enjoyable event. I'm sorry that so many on the waiting list were unable to join us. We'd love to have more pictures. I'm planning another page from the party. I've had about as much luck calling this a "fan gathering" as the CMA has in renaming Fan Fair to CMA Music Fest. <smile> It was a "gathering," but it sure felt like a party. It was wonderful to hear the great music and see old friends again. Wade commented later on how much he enjoyed seeing everyone again. This is a 2-day event (Friday and Saturday). Wade will be there Saturday night only. A single-day adult admission is $10. That does not include the $10 parking. This is an outside event at the Pavilion - a large roofed shelter that's near the McGavock Pike entrance to the Opry Mills Mall. As you go north on McGavock Pike, pass the entrance to the hotel and look for the mall entrance on the left (this is a back entrance to the mall) Pack your lawn chairs. I'm not certain there will be seating. Yes, I know most stations are locked into play lists that play the same current 10 over and over. But there are smaller stations that take requests and we want them to remember Wade and play his music. Our friend, Wade fan, and extraordinary computer programmer, Gayle, has set up a page to make it easy for you to find stations in your area. And we each do need to concentrate on our own neck of the woods. Check out this page. She's included stations that report to the Music Row Country Breakout Chart, which seeks smaller stations that are programmed locally. On the first page, enter your zip code or city, state. When you get the second page (which is the listing of all the radio stations in your area), scroll down to near the bottom of the page, where it has a box for Station Format - change that from Any Format to Country. 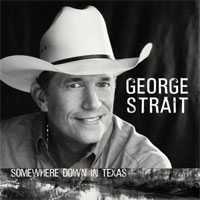 The listing of stations you now see will be the country radio stations in your area. When you click on the little "i" on the left, you'll get information on the station. Wade and Trent Willmon, Shelly Fairchild, Jon Randall, and Jeff Bates are the performers on a 4-night Western Caribbean Cruise - to Cozumel and back - leaving Galveston, Texas on October 27th (Thu), returning to Galveston on Monday morning, October 31st. October 27 - October 31st - Galveston to Cozumel and back. I'm beginning to hear from "cruisers" who went on the first two trips about what a great time it was. And I'm hearing from Wade fans who've already signed up - sounds terrific! Occasionally, we'll publish a web page that can only be reached for a limited time through the link that we list in WOWW! It's a bonus for subscribers. This time it's a "mystery" sound file. Gayle, our great Wade Hayes' supporter and talented computer programmer, has met the requests for a message board. She's set up an ad-free forum site for fans. She kicks it off with the first post - "Welcome Wade Hayes Fans." Were you there for the first fan club party at the lake? Laurie Paulik and Heather Baniszewski have an extensive gallery of photos on their Mountain West Music site. You'll enjoy reminiscing with their pics. Here's the link to their Wade gallery. WOWW!, an e-mail newsletter to Wade Hayes fans, began in December, 1997. Subscribers reside in FIFTY (50) states as well as - Australia, Brazil, Canada, Germany, Iraq, Japan, Netherlands, South Korea, Spain, New Zealand, Hong Kong. Keep us up to date on your address. When you make a change send us the old one (so we can remove it) and the new one so that we can add it. We don't want to lose you. Special Offer: Order Somewhere Down In Texas now and receive immediate access to the following in your Digital Locker: An audio stream of nine tracks from the album! Check out the buys on Jo Dee Messina CDs Here! 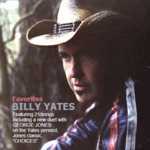 Releases Third Single "Race You to the Bottom"
Country music duo The Bellamy Brothers (www.bellamybrothers.com) are set to appear on FOX News Channels highly rated morning show FOX & Friends on Friday, July 15th. The Bellamys will perform songs from their latest Curb album Angels & Outlaws Volume 1. The FOX News Channel appearance will take place upon The Bellamy Brothers return from a two week European tour that kicked off on July 2nd . Joining them on the tour as an opening act will be David Bellamys sons Jesse & Noah. These second generation Bellamy Brothers have been putting the finishing touches are their debut album and have been performing in several southern cities. 'Weve been playing a lot of honky tonks and writers nights during the last couple of years so were really excited that we got to perform on a Festival Tour with our Dad and Uncle for the folks in Europe,'' according to Jesse and Noah Bellamy. Get Free Shipping on orders $50 or more at Time-Life! Enter LK7755A at checkout. Expires July 31st. Receive 15% off on orders $60 or more at Time -Life! Enter LK7755B at checkout. Expires July 31st. 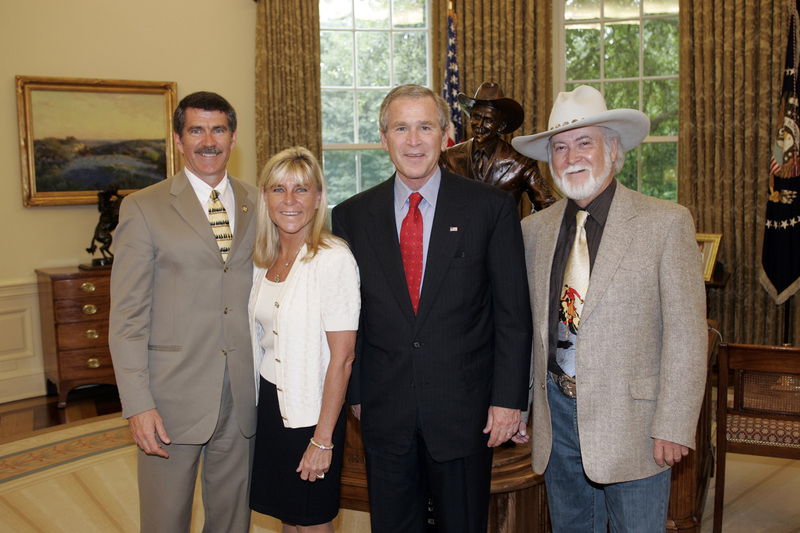 (NASHVILLE, TN)  Jett Williams, daughter of legendary Hank Williams, joined renowned Montana sculptor Bill Rains, and Montana Congressman Denny Rehberg to present President George Bush a nearly life-size bronze statue of Hank Williams in a private meeting with the President at the Oval Office on June 29th. The statue weighs approximately 200 pounds. President Bush, a fan of country music in general and of Hank Williams in particular, plans to display the statue in his presidential library. While I have been to the White House many times, this truly was a special occasion. Presenting this beautiful work of art to a President I admire, support and respect and who loves my daddywas an event I will never forget. But the best part was sharing Hank stories with each other, Jett commented on her visit. 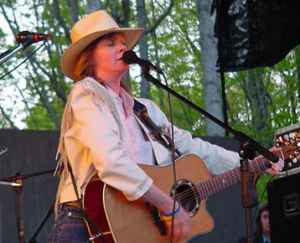 Jett Williams, no stranger to the White House, struggled for over 10 years for the right to claim her heritage as the daughter of the late Hank Williams. Rains, who sculpted the statue, resides in Congressman Rehbergs state of Montana, and is recognized as one of the nations premiere portrait sculptor. In addition to being displayed in the White House, a smaller version of the Hank Williams statue also resides in his daughters home. Accompanying Jett Williams was her husband Keith Adkinson. 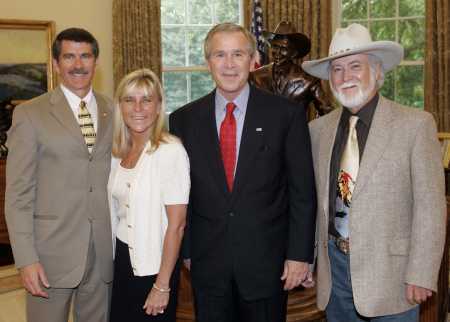 President George W. Bush is joined by Denny Rehberg, R-Mont; Jett Williams, daughter of Hank Williams, and artist Bill Rains in the Oval Office of the White House Wednesday, June 29, 2005. Behind them is a 5-foot-tall bronze statue of Hank Williams that Mr. Rains sculpted and presented to the President. The Great Depression and World War II...two defining moments within American history that proved the resilience of men and women everywhere and molding what many call the Greatest Generation in American society. This tribute compilation is a celebration of the fragrance of freedom that so many spread for future generations to cherish. Salute!-The World War II Tribute Album features top artists such as LeAnn Rimes, The Judds, Marie Osmond, Kenny Rogers, Crystal Gayle and others. Proceeds from this project will benefit the National World War II memorial and veterans. I get a lot of encouraging letters from people who say nice things about my writings... songs, articles, and stories. Its a real incentive to write more. Most of my writing seems to me to be accidental. By that I mean: I have never planned or plotted a story or song in my life. I dont know how. I usually let my mind wander into a situation, real or imaginary, and the pictures unfold in front of me. I just take down what happens, as it happens. I dont know what the ending will be until it ends. Im as surprised as everybody else. I seldom know the title of a song until the rest of it is done. I often have a temporary working title but its usually replaced and demoted to a line somewhere in the piece. Any craftsmanship I may have comes later, when I go in and heartlessly edit the whole thing, trying to get rid of all phrases that dont add to the story, and replacing all words that are almost right with ones that are closer to right. I dont like fill-in lines. Id rather have it short. Or, maybe a better word is tight. In school sports I was a good sprinter but not good in any race over 100 yards. I did okay in football, baseball, and hockey because the action is in spurts. My writing limitations are the same... short all-youve-got bursts. I like composing song lyrics. because theyre miniatures, like little pieces of jewelry. Working out the music part is fun because the secret of music is surprises. The music can come first, last, or along with the words. No formula works for me all the time. Im telling you this because people are often interested in how writers work. I know I am. I would write even if I never got paid... which is somewhat true. WHY WE LIKE OR DON'T LIKE MUSIC. 6. We don't like the guys playing it. Musician "A" has conquered the simpler forms of music, gets bored, and looks for challenges elsewhere. Musician "B" is still working on his E chord, and doesn't need or want to look elsewhere. Don't try to hand him your diminished chords. They would only screw up "Jumbalay'", which is true. B may even resent music that is beyond his expertise. B doesn't like A's music, or the horse he rode in on. A feels an unhealthy need to educate B by making him listen to more music styles. B will say they all stink. "If you say everything stinks, you will be right some of the time." Albert Einstein. Fortunately for A, there are a zillion people in the world, several of whom may understand what he's playing. Fortunately for B, A will eventually give up and leave him alone so he can perfect his open E chord. Musician C is playing Hip Hop music, and nobody with an IQ over 22 cares if he hip hops into a jet engine. In Rock it doesnt seem to matter so much, but in Country we want to hear the words. I hear too many recordings where the lyrics are lost. If the words arent audible there are several possible culprits. The singer may not be making them clear, or the producer and engineer arent recording them right. Sometimes the singer tries too hard to sound Southern or Country, and it comes out slurred and run together. Heres a trick to get rig of Singers Lockjaw: Pretend youre singing to a deaf person who is reading your lips. When Misty and I record vocalists (ourselves and other artists) we use a soft-knee compressor on the mike and maybe later in the mixdown. The compressor brings out the low notes, the soft words, and the nuances that give an artist identity. The compressor should be set conservatively at 2.5:1 or less. The compressor itself should be inaudible. Sometimes the voice needs presence, or edge. To add vocal presence we boost the frequency slightly at 2 kHz, and maybe a touch at 4 kHz. Too much presence can make the voice brassy and thin. A little can make it sound good, and bring out the lyrics. Enhancers like Aphex and BBE can help with general clarity, and instrument/vocal separation, but they can be overdone, if were not careful. and we try not to have too much going on in the singers frequency range. Misty and I find it helpful to analyze the lyrics beforehand, marking on lyric sheets where we want to take breaths, and which words we want to punch. If a song is good enough to record the lyrics should be heard. Each of us has different methods and tastes. Im sharing ours just in case it may help somebody. COMING YOUR WAY NOW !! 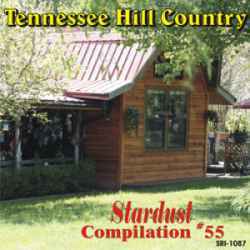 GREAT COUNTRY MUSIC FROM STARDUST OF NASHVILLE! DJs Are you getting the Stardust releases ??.. If not, it must be because we don't have your mailing address. Please send it to us at cbd@vallnet.com and we will be glad to add YOU to our VIP list !! 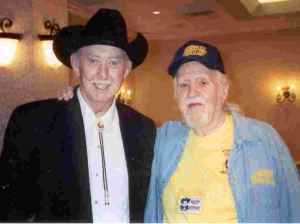 Jack & Buster have known each other since Jack was a drummer for the Great ERNEST TUBB and playing at our "FRONTIER JAMBOREE" THEATRES !! 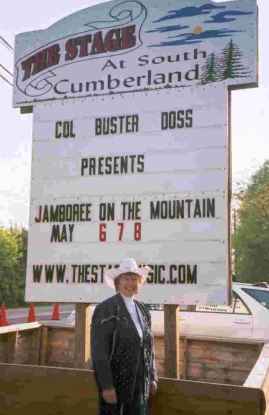 When I first starting discussing the idea of the "Jamboree on the Mountain" with some friends, we agreed to a few ground rules, NO CHARGE to the artists for tickets or to showcase and no competition or awards! It would be more like a family picnic where we all could see old friends and make new ones. None of us had any idea that it would attracts artists from all over the world. BUT IT DID!! The picture above is of DOREEN BROWN from CANADA!! and one of them was when JULIE TAYLOR & the "FIRE MOUNTAIN BAND" WERE ON THE STAGE! GET YOUR MESSAGE OR PLAYLIST OUT TO THE WORLD ! POST ON THE STARDUST MESSAGE BOARD !! D'Ramirez at the "American Jukebox Theater"
JULY 10,2005 COUNTRY MUSIC STAR RAZZY BAILEY, WITH OVER 30 TOP CHARTED RECORDS FOR RCA RECORDS IN HIS CAREER. THIS MAN IS TRULY AMAZING. ON THE JULY 10TH PROGRAM. HER CURRENT RELEASE "I GUESS YOU HAD TO BE THERE" IS ENJOYING CHART ACTION. SOUL STIRRING MATERIAL. YOU DO NOT WANT TO MISS THIS EXCITING PROGRAM. RUSTIE BLUE RELEASES "TOMORROW TONIGHT"
Rustie Blue has released the third single off of her Chip Chip CD titled Tomorrow Tonight. The song was written by Deborah Allen and Bill Anderson (who is also Rusties duet partner on Chip Chip). This mid-tempo ballad is about a couple getting together for the very first time and not worrying about anything else but that moment. Tomorrow Tonight can be found on Chi HotDisc #79 and Mark Trail on M-T-M #12.
one of the highlights from Rustie Blue's current album, "Chip Chip," and is without a doubt one of her finest vocal performances of her career to date... Hot-N-Gold out of London and BBC Radio Lancashire have already picked up the song. Rustie Blue appeared on several charts with "The Devil May Care," the second single off of her Chip Chip album! She went to #1 on the Number One Music traditional country chart in June. "The Devil May Care" is currently at #6 on the Indie World Country Chart. Rustie is nominated for the French 2005 Music Box Country Rising Artist and Outgoing Artist Awards! Winners will be announced in November or December in a theatre in Paris, France. She is also nominated for Favorite Country Album, International Entertainer, and Song of the Year for Chip Chip in the Texas River Awards. Rustie Blue and Bill Anderson also won 2005 European CMA Awards Vocal Collaboration of the Year for their "Chip Chip" duet, which appears on the latest CD by both artists. MP3s of Tomorrow Tonight, a copy of the Chip Chip album, interviews, & photos available to the media by request. and click on the menu at the left that says NEW! ON HOT-N-GOLD to view Rustie Blue's feature. Hot-N-Gold also welcomes your emails. Email Hot-N-Gold at studio@hotngold.co.uk and let them know what you think of Rustie's songs to keep them playing!! They are currently playing "Chip Chip," "The Devil May Care" and they have also just added, "Tomorrow Tonight." THANKS HOT-N-GOLD!! and click on the menu at the left that says, Le To Twenty, to register to vote. Rustie is currently #9. She is in with a great bunch of talent! THANK YOU ALL AT MUSIC BOX TV and to all the listeners!! Thank you so much for all of your great support to Rustie!! I thought you might be interested to know that Bow Thayer's rootsie acoustic single "Get Lost Again" from his critically acclaimed solo CD "The Driftwood Periodicals, Volume 1" is hitting Americana and alternative radio playlists across America this week. Bow and I hope you'll make time to listen, and if you like it, please share it with My Kind of Country's readers or listeners. And if you do, please let us know, so Bow can acknowledge your support at gigs and we can link to your website from www.bowthayer.com and http://www.crookedroot.com. Bow is available for telephone interviews almost anytime he's not playing or travelling to a gig. If you have any inkling to chat with Bow, please give him a call directly at 802-234-4007 or call Crooked Root Records at 802-234-9950 to schedule a time. Thanks very much for your time. I hope you enjoy the single "Get Lost Again" and the CD "The Driftwood Periodicals, Volume 1." P.S. Crooked Root Records is my small (actually "micro") label, propelled by a love of the music and a sincere belief in the magic of artists like Bow. I do not have the budget to advertise much or, thankfully, to "pester" you about our existence. I just hope you'll like the music and you'll introduce your audience to Bow. Thanks again for your time. This message a courtesy of Crooked Root Records. Click here to subscribe to news about our artists. For booking information, call 802-234-9950 or send an email to booking@crookedroot.com. Country radio is currently very hot and will make a big impact on the 30th anniversary of The Conclave Learning Conference, the Midwests multi-format convention, as Keith Urban, The MuzikMafia, Billboard Magazine and the Country Radio Broadcasters converge to present Country in Minneapolis July 21-24. Are you traveling this summer, without a lot of time to concentrate on your songwriting? We've got some special short e-workshops just to keep you motivated and creative. SONG 180 The Writer's Room: The Urban Experience. Jump in as #1 writer, Jack Knight, (cuts by J-Lo, Usher, Monifah), breaks down and explains the process behind his hit song, "My First Love" (recorded by Carl Thomas). SONG 230 Song Production for Film/TV. Find out what it takes to create a demo to pitch for Film/TV with hit writers, Jack Sundrud and Craig Bickhardt as they talk about a song they wrote, demoed and pitched for the Showtime original series, "Huff". SONG 181 The Writer's Room: Writing For Film. Get the inside scoop about writing (and re-writing) for Film as Grammy nominated writer, Pamela Oland breaks down the song she wrote for the opening/closing to Disney's "102 Dalmatians" (she wrote 32 verses in all!). BUS 250 The Business of The Independent Songwriter. Learn more about the business of making money as an independent songwriter in this special two-week e-Workshop led by #1 writer, Craig Bickhardt. We love it when our SongU.com members are out there slugging away against the big music industry beast and winning some battles. So applause to Lisa Medill, whose song, "Take Back The Night", is being pitched for a possible book deal while another one of her songs, "Next To Nothing" (co-written with member Lorna Flowers) is currently being performed by the group, "Great Guns" who are opening for Phil Vassar at Summerfest. 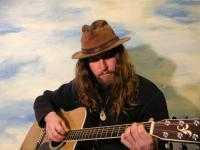 High-five to Randy Thomas whose song, "You Love Me, You Don't Know It Yet" is climbing the indie country charts. Hats off to Vaughan Ray Daniel whose song, "Highway Miles", is being showcased the entire day of the 4th of July at Garageband.com and has been put into rotation on Country Radio in Canada. Congrats to MB for signing three single song agreements in the past couple of months with major publishing companies in Los Angeles. A standing ovation for Krystle-Blue who was named "Best New Artist" for her R&B vocal performance at the finals of the USA World Showcase, held last week at the MGM Grand in Las Vegas. Congrats to Rebecca Hosking whose vocal talent and songwriting talent peaked the interest of the legendary Skaggs family who have expressed interest in working with her. Incidentally, they discovered Rebecca's voice and her songs on her SongU.com Member Website (after seeing a message with her signature and web address). And a round of applause to Lorna Flowers and Shelley Jacobson on signing their first staff writing deals with Full Court Press Music. Thanks for making the SongU.com campus rock! Suddenly a tiger appears in the distance running toward them. One friend pulls a pair of 'Nikes' out of his bag and quickly puts them on. "I just need to run faster than you".